VMware vSphere only installs and runs on Enterprise class PC Servers, shared storage and networking - which can cost thousands of dollars and requires skilled technical resources to configure for proper use. 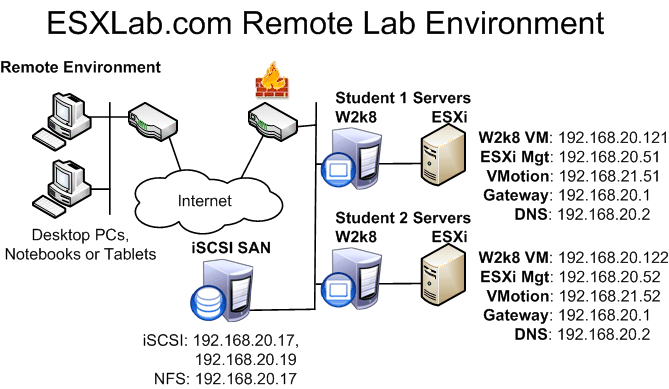 ESXLab takes the cost and risk out of running VMware vSphere labs by making pre-configured, ready to run, classroom labs or individual self-study VMware labs available for rent. A server Pod is a set of one or more virtual servers organized into a lab (we call a pod). We have sufficient facility to comfortably support 150+ learners concurrently - with no slow downs or resource contention. Our labs are dedicated to each customer (not shared) and are available 24hrs/day during the lab rental period.